Please be aware of any message coming from sources not affiliated with AIChE. Avoid interaction with them. Valid emails come from @aiche.org, aiche@confex.org, and AIChE mail@connectedcommunity. Unfortunately, emails are circulating that offer to sell attendee lists for many of AIChE’s conferences and those run by our technical entities. These emails are sent by scammers impersonating AIChE. Note that AIChE does not sell its exhibitor or attendee lists, and no third-party is authorized to distribute or sell any lists related to our events. Statements claiming to offer our attendee lists are fraudulent. Conference exhibitors may obtain attendee lists with postal addresses, but no emails are provided. If you receive emails that propose to sell AIChE conference attendee lists, do not engage with the sender and delete the message immediately. Our conferences are also the target of hotel scams. 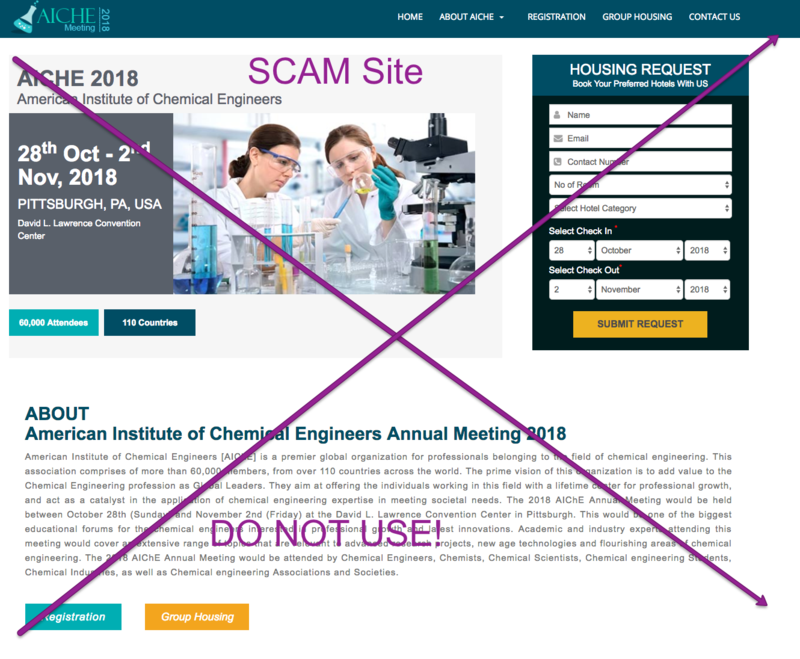 Scammers call or email attendees and exhibitors, claiming to represent AIChE or AIChE vendors, and encourage our customers to book rooms using fake promotion codes at a variety of hotels close to the conference venue(s). AIChE2018.com is an example of a scam site. Do not click on this url for booking. AIChE and our host hotels will never send emails or place phone calls to individuals in order to promote specific accommodations. Any legitimate message to attendees will direct them to the conference’s hotel information page, where attendees will find secure links to our approved hotels. On occasion, when AIChE assesses hotel room availability prior to conferences, we may send a message urging people to obtain their housing if they have not already done so. In those instances, emails will come directly from AIChE or customerservice@aiche.org and will direct guests to the approved hotel information page on an AIChE site. If you receive emails or calls regarding discounted AIChE hotel accommodations, please disregard and do not engage with the sender. AIChE only sends emails through @aiche.org email addresses, through the Confex abstract management system (aiche@confex.com), or through AIChE Engage (AIChE mail@connectedcommunity.org). No emails are sent via Gmail/Yahoo/Hotmail, or other such accounts. Below are some examples of safe emails. Remember: AIChE does not rent or sell your email address to third parties. Remember: Do not click on any links that looks suspicious. If you are solicited by a scammer, please notify AIChE customer service at customerservice@aiche.org or by calling them.